Parrot Bluetooth phone kits have been on our product portfolio and have therefore been fitting them in Leeds since they were brought to the market many years ago. We have installed Parrot Handsfree kits in Leeds into all types of vehicles in Leeds keeping many motorists within the law. These vehicles range from Cars, Vans, HGV, Tractors, Horesboxes & limosuines, whatever your vehicle Safe & Sound Vehicle Systems can professionally install your chosen Parrot Handsfree Fitted in Leeds with ease. As Parrot Certified Mobile Installers we are able to offer the full range of Parrot Car Kits to be fitted & installed in Leeds with unique benefits including extended warranties that other installers can not support. 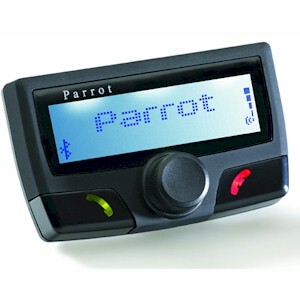 As part of been a Parrot Certified installer we are of course able to repair the full range of kits around the Leeds area including supplying replacement microphones, screens, cables and Parrot Sofware Updates using specified software update cables ensuring the longevity of your Parrot Handsfree life expectancy. Having a professional installation of your Parrot Handsfree Fitted in Leeds allows you to rest assured no corners are cut, this means we use correct vehicle harness adapters (known as Sound On Top leads) to ensure the vehicle warranty remains in place and that all cables are routed throughout your vehicle so's not to interfere with the normal operation of the vehicle and it's safety features - including AIRBAGS. We are happy to provide images which show the correct placemnet of the microphone on Parrot Handsfree Fitted in Leeds and the routing of the cable behind the A post trim and more importantly behind the AIRBAG. Many companies often offering rock bottom prices are not always quite so thorough. Remember the cheapest price is not always the best price. We offer all models of the Parrot Handsfree fitting range for mobile installation & fitting throughout Leeds, including the CK3000, CK3100, MKi9000, MKi9100 & MKi9200. Feel free to contact us to discuss your requirements.